Whenever I go castle hunting, I also try to look up minor castles in the vicinity of the the place I am visiting. Not to far from Schloss Marienburg, the seat of the Guelph family near Hanover, lies nestled away in a small village by the same name Schloss Rössing. While you cannot view the interior, the castle's park featuring lakes and streams is open to the public so you can get a good look at it - and I must say that I was really impressed as it curiously combined many different styles showing its evolution over time. Schloss Rössing owes its existence to nobleman Ludolph von Rössing, who built a Renaissance-style castle in typical local half-timbered style between 1579 and 1589. 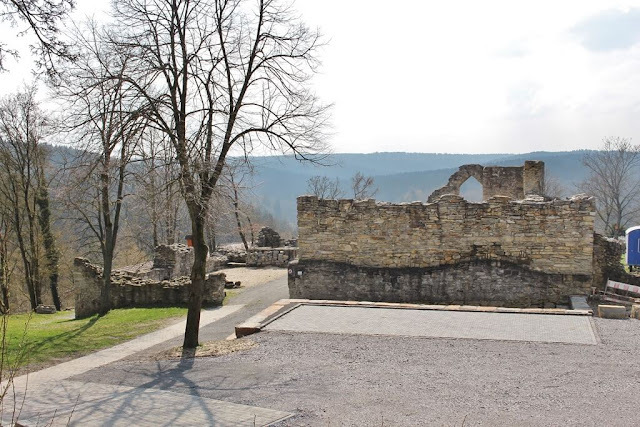 Another castle dating back to the 14th century owned by his family had previously been located on the same site but was razed in 1431 by Duke Wilhelm I of Brunswick-Lüneburg, named the Victorious. The Rössings were forbidden to rebuilt the castle for a good 150 years. Located in the border regions between the traditional Guelph territories and the reach of the Prince-Bishops of Hildesheim, a castle probably wouldn't have survived to this day anyway as the village of Rössing was raided and damaged heavily during feuds numerous times in the 15th and early 16th century. While the 16th century castle does include prominent features of the local Weser-Renaissance style, it was built in less opulent style than more famous examples. (Confession of a Castleholic: For a long time, I was not a big fan of many Renaissance-style buildings in Northern Germany because they all seemed to look the same. However over recent months, they have really been starting to grow on me as I notice all the variations and details.) Schloss Rössing isn't just Renaissance though as it was expanded around the year 1830 by adding a manor house that includes the castle's more representative rooms. The addition to the castle was later given a Neo-Gothic facade and tower in 1909. To this day, the Schloss is owned by the Barons of Rössing who continue to call the castle their home. Schloss Rössing is privately owned and not generally open to the public. I have been informed that since my visit, the park of the castle has also been closed to the public.